I’ve been reading and writing about the imminent demise of leaded components for decades. Even so, at least half of my work still involves leaded components. After all, what’s not to like? Leaded components are easy to work with. It’s easy to identify the value of a leaded resistor or capacitor with the naked eye, and leaded components are readily available. Besides, I’ve already committed the band values — red for two, orange for three, yellow for four, etc. — to long-term memory. Then, there’s the muscle memory of how to bend leads and how to work a soldering iron tip around the porcupine-like mass of leads when the component side is down. Why let all that learning go to waste? 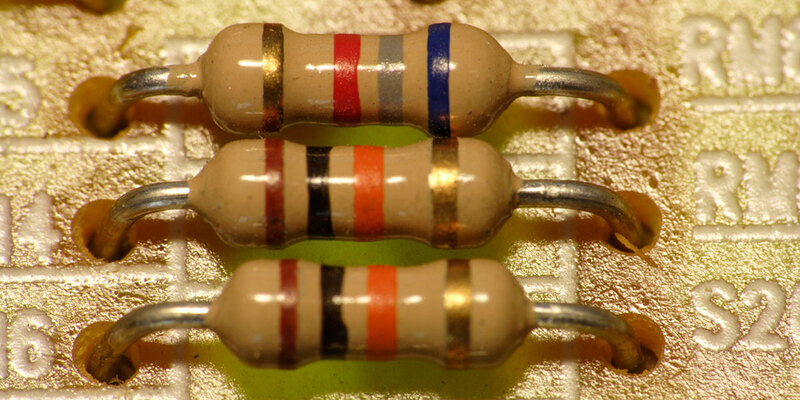 I don’t know what I would do without a good supply of 1/4 watt 10K leaded resistors to use as circuit probes. When I’m working with an Arduino or other microcontroller board, it takes only a few seconds to wire-wrap a 10K pull-up or pull-down resistor to an I/O pin. Try that with a surface-mount (or SMT) resistor. Then, there’s the differential in infrastructure cost and workbench real estate. For leaded components, I have a simple Weller temperature controlled soldering iron, good old-fashioned needle-nose pliers, and desk lamp magnifier. For surface-mount work, I have a hot air station that has the footprint of an oscilloscope, a tool drawer full of tweezers and stainless steel picks, and a half dozen containers of various solder pastes and fluxes. And forget the magnified desk lamp — I have to don a Bosch & Lomb stereo magnifier and get my nose within inches of the board to see what’s going on. One sneeze, of course, and every SMT component not glued or soldered down will be forever lost in the dust balls behind my workbench. I know that experimenters aren’t alone in the battle between SMT and leaded components. I routinely tear down equipment for both fun and profit, and it’s unusual to find an electronic device devoid of leaded components. Many of the inexpensive devices made in China — from drone controllers to electronic measuring devices — are made with a mystery chip embedded in a black epoxy blob that is surrounded with leaded capacitors and resistors. This is understandable, given the cost of converting an electronics assembly plant from leaded to SMT devices. Unless you’re building iPhones or electronic watches, why upgrade an assembly plant unless you have to? The bottom line is that if you’re just getting into electronics, don’t be dismayed — or distracted — by the world of SMT. A traditional perfboard, a good supply of leaded components, and a few schematics to work from will get you started.